The Great Isaiah Scroll (1QIsaA), Copied c. 125 B.C. Of great interest to textual scholars are the Dead Sea Scrolls, the remains of an Essene library found in caves at the north-west end of the Dead Sea in the late 1940s at a site called Qumran. The scrolls provide our oldest copies of any portion of Scripture, including a few manuscripts that date to the third century (200s) BC. The majority, however, were copied in the period 150 BC—AD 68. 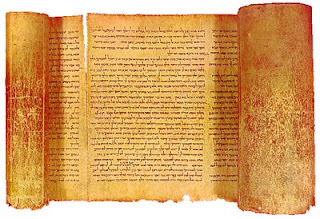 All of the protocanonical books of the Old Testament are represented at Qumran except for Esther and Nehemiah; however, apocryphal books like 1 Enoch and Jubilees are better represented than most biblical books, and just as many copies of the deuterocanonical Tobit (six) were discovered as of Jeremiah, Ezekiel, or Job. For this reason, as mentioned above, most scholars believe the Essene canon was significantly different than that of the Pharisees and modern Rabbinic Judaism. Fragmentary remains of about a thousand scrolls were found at Qumran, of which about a quarter (~222) were copies of biblical books, almost all in Hebrew. Many of the Hebrew biblical texts found among the Dead Sea Scrolls appear to follow the textual form that we now know as the Masoretic. (Scholars give figures between one-fifth to one-half, depending on the method used to categorize the manuscripts.) The other biblical texts display differences in wording, including some that agree closely with the Septuagint (about 5% of the texts), others that agree with the form of the Pentateuch used by the Samaritans (also about 5%), and a large number that had unique readings (differences of wording) in many biblical passages. The Dead Sea Scrolls changed how scholars viewed the history of the text of the Old Testament. It became clear that in antiquity, around the time of Jesus, the text of the Old Testament varied slightly from Hebrew manuscript to Hebrew manuscript. Over time, the Jewish rabbinical tradition, culminating in the work of the Masoretes, settled on a standard form of the text—an ancient and generally good form of the text, to be sure, but only one of those that circulated in antiquity. The discovery among the scrolls of Hebrew biblical texts that agreed closely with the Septuagint Greek also changed the way scholars viewed that translation. Certain books of the Old Testament, notably Jeremiah and 1 Samuel, had long been known to have some significant differences from the Hebrew Masoretic Text. Many suspected the Septuagint translators as being responsible for these differences. The Scrolls clarified, however, that the Septuagint translators had, for the most part, translated the Hebrew in front of them straightforwardly. The more significant differences between portions of the Septuagint and the Masoretic Text were due to differences in different Hebrew editions of the biblical books, not the activity of the translators. While the Dead Sea Scrolls did change the way scholars understand the development of the Hebrew text of the Bible, it has not fundamentally changed the translations in use among modern believers, whether Christian or Jewish. The variant readings found in the Scrolls were—and are—of great interest to biblical scholars who specialize in textual criticism (the study of the exact wording of Scripture), but other theologians and lay people find them of less interest. The vast majority of variations in wording are trivial (a few missing or additional words; the substitution of synonyms; changes in declension or conjugation), and of those that are significant, it is usually easy to identify which manuscript represents the more original reading, and which contains an error or intentional change.